I truly believe that as human beings capable of learning, growing, experiencing and feeling so much that the ebbs of flows within our lives are all little lessons. Moments where we deepen our understanding of our reason for being, our time on this earth and our purpose. When I look back a few years ago when I was in the thick of my Saturn Returns – I was questioning who I was, what I wanted to be, how I wanted to contribute, what my purpose was – I remember the height of it all being one of my darkest days. I had moved home twice already that year, a friend had passed away, I was living in an environment that made me literally feel anxious and jumpy. I then had to move again… the day of the move, it was raining and I had decided to go it alone. One box at a time I unloaded my car. The whole while I was crying. Continuous tears streaming down my face. It was the pinnacle of a collection of emotions – displacement, confusion, anxiousness, sadness – literally pouring out of me. For months I hadn’t been able to shift this heavy feeling inside me. I’d resisted the emotion and tried to be strong. I had tried to avoid what I was feeling. That day, in the rain, crying, I finally went there. I indulged in the sadness, the frustration, just for a little while. I sat right in the emotion. In fact, we held hands – me and the sadness. It wasn’t even a week later when I recall going for a coastal walk. As I stood in the sunshine staring out across the ocean I physically felt the heaviness of those stuck emotions lift up and out of me. I realised something had shifted. But what rang loud and clear was that it had shifted because I had acknowledged it, that day in the rain. For the first time in months I had stopped pretending I was ok, fine, coping and had allowed myself to fall apart. Just enough to loosen the grip of that horrible feeling. Everything from that day onwards changed. I appreciated happy days with such a different perspective. Each one tasted so sweet. And today, whenever I have a ‘bad’ day I take myself back to that place and remember the feeling of unloading my car, alone, crying. It resets me, regroups me. Reminds me of everything I have to be grateful for. But mostly, it reminds me that it’s all going to be ok. That the bad days have to happen in order for me to taste and experience the good days. I wonder then, can we embrace the good, the bad and the ugly. Realising that is what makes us human beings so unique. The scope of the emotions and experiences we can have is unimaginable. But each one guides us and teaches us something if we are willing to go there, have a peek, acknowledge. 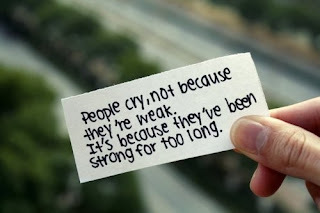 And sometimes, with those emotions come tears…and that’s ok too. 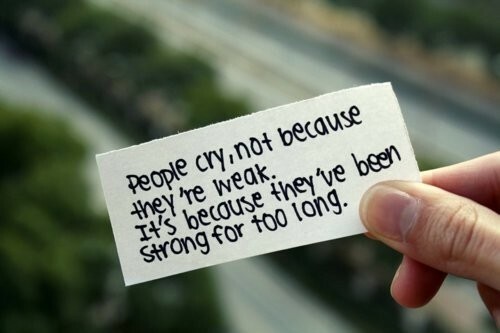 Because those tears, bubbling up the surface, not only bring the emotions up with them but they help to release and let them go. Allowing you to stop thinking and start feeling. From there, change is possible. Change is inevitable. That’s where the real happiness is born.